Roasted peanuts (peanuts, salt), milk chocolate flavored coating (maltitol, palm kernel oil, nonfat dry milk, cocoa powder, soy lecithin, salt, natural flavor), maltitol syrup, whey protein isolate, inulin, polydextrose, salted butter (cream, salt), water, peanut butter (peanuts, mono and diglycerides, salt, mixed tocopherols(to maintain freshness)), contains less than 2% of: palm kernel oil, milk protein isolate, nonfat dry milk, peanut oil, vitamin mineral mix [magnesium oxide, sodium ascorbate, ascorbate acid (vitamin c), DL-ALPHA-Tocopheryl acetate (Vitamin E), niacinamide (vitamin b3), zinc oxide, d-calcium pantothenate (vitamin b5), vitamin A Palmitate, thiamin mononitrate (vitamin b1), pyridoxine hydrochloride (vitamin b6), riboflavin (Vitamin b2), chromium amino acid chelate, folic acid (vitamin b9), biotin (vitamin b7), sodium selenite, phylloquinone (vitamin k1), vitamin b12], salt, soy lecithin, sucralose. Contains peanuts, soy and milk. Made in a facility that also uses wheat and tree nuts. Caramel layer [fructooligosaccharides, polydextrose, palm kernel and palm oil, salted butter (cream, salt), water nonfat dry milk, glycerin, soy lecithin, mono and diglycerides, salt, natural flavor, sodium citrate, carrageenan, sucralose], chocolate flavored coating [palm kernel oil, polydextrose, maltitol, whey protein concentrate, cocoa powder (processed with alkaki), whole milk powder, soy lecithin, salt, natural and artificial flavor, sucralose, acesulfame potassium], roasted peanuts (peanuts, soybean oil, salt), protein blend (soy protein isolate, hydrolyzed gelatin, whey protein isolate), glycerin, water, polydextrose, peanut butter (ground roasted peanuts), cellulose, peanut oil, olive oil blend (olive oil, maltodextrin sodium caseinate, mono and diglycerides, dipotassium phosphate), palm kernel and palm oil, clarified butter, soy lecithin, natural and artificial flavors, vitamin mineral mix (magnesium oxide, sodium ascorbate, ascorbic acid (vitamin C), dl-alpha-tocopheryl acetate (vitamin E), niacinamide, zinc oxide, d-calcium pantothenate, vitamin A palmitate, thiamin mononitrate, pyridoxine hydrochloride (vitamin B6), riboflavin (vitamin B2), chromium amino acid chelate, folic acid, biotin, sodium selenite, phylloquinone (vitamin K1), cyanocobalamin (vitamin B12)], salt citric acid, sucralose. FR03. Contains peanuts, milk and soy. This product is manufactured in a facility that uses tree nuts, eggs, wheat and sesame seeds. Chocolate flavored coating [palm kernel oil, polydextrose, maltitol, whey protein concentrate, cocoa powder (processed with alkali), whole milk powder, soy lecithin, salt, natural and artificial flavor, sucralose, acesulfame, potassium], caramel layer [fructooligosaccharides, polydextrose, palm kernel and palm oil, salted butter (cream, salt), water, nonfat dry milk, glycerin, soy lecithin, mono and diglycerides, salt, natural flavor, sodium citrate, carrageenan sucralose], cocoa soy nuggets [soy protein isolate, cocoa powder (processed with alkali), tapioca starch], glycerin, sunflower oil, inulin, hydrolyzed gelatin, maltitol syrup, maltitol, unsweetened chocolate (processed with alkali) polydextrose, cocoa powder (processed with alkali) soduble corn fiber, palm kernel, and palm oil, water, milk protein isolate, cocoa butter, vitamin mineral mix [magnesium oxide, sodium ascorbate, ascorbic acid (vitamin C), dl-alpha-tocopheryl acetate (vitamin E), niacinamide, zinc oxide, d-calcium pantothenate, vitamin A palmitate, thiamin mononitrate, pyridoxine hydrochloride (vitamin B6), riboflavin (vitamin B2), chromium amino acid chelate, folic acid, biotin, sodium selenite, phylloquinone (vitamin K1), cyanocobalamin (vitamin B12)], salt, natural and artificial flavors, cellulose, nonfat dry milk, soy lecithin, sucralose, salted butter (cream, salt), acesulfame potassium. FR03. Contains milk and soy. This product is manufactured in a facility that uses peanuts, other nuts, wheat and seeds. This product is manufactured in a facility that uses tree nuts and wheat. Contains peanuts, almonds, cashews, milk, soy and sesame seeds. Nut blend [roasted peanuts (peanuts, soybean oil, salt), almonds, roasted cashews (cashews, vegetable oil (peanut, cottonseed, soybean and/or sunflower oils))], chocolate flavored coating (maltitol, palm kernel oil, polydextrose, cocoa powder, nonfat dry milk solids, natural flavors, soy lecithin, salt, sucralose), pretzel sticks (soy protein isolate, corn starch, sesame seeds, palm oil, tapioca starch, inulin, pea fiber, rice syrup, xanthan gum, salt, baking powder, yeast), chocolate flavored chips [maltitol, chocolate liquor (processed with alkali), cocoa butter, soy lecithin, vanilla extract], polydextrose, maltitol syrup, raisins, soy protein isolate, water, palm kernel and palm oil, glycerin, salt, mixed tocopherols and TBHQ (to preserve freshness), sucralose. Soy crisps (soy protein isolate, whole wheat flour), glycerin, polydextrose, whole grain rolled oats, chocolate flavored chips (maltitol, chocolate liquor [processed with alkali], cocoa butter, soy lecithin, vanilla extract), palm kernel and palm oil, maltitol, sunflower oil, hydrolyzed gelatin, whey protein isolate, contains less than 2% of: roasted almonds, cellulose, coconut, cocoa powder [processed with alkali], natural and artificial flavors, soy lecithin, calcium carbonate, whole milk powder, salt, vitamin mix [vitamin A palmitate, ascorbic acid (vitamin C), niacinamide(vitamin b3), riboflavin (vitamin B2), thiamin mononitrate (vitamin B1), folic acid (vitamin b9), dl-alpha tocopheryl acetate [vitamin E]), sucralose, acesulfame potassium. Contains soy, wheat, milk, almonds, coconut. Made in a facility that also uses peanuts and other tree nuts. Hazelnuts, chocolate flavored coating (maltitol, palm kernel oil, polydextrose, cocoa powder, nonfat dry milk solids, natural flavor, soy lecithin, salt, sucralose), soy nuggets (soy protein isolate, tapioca starch, rice flour, malt extract, salt), chocolate flavored chips (maltitol, chocolate liquor [processed with alkali], cocoa butter, soy lecithin, vanilla extract), polydextrose, maltitol syrup, Contains 2% or less of: water, palm kernel and palm oil, glycerin, natural flavor, cocoa powder (processed with alkali), salt, sucralose. Contains hazelnuts, soy and milk. Made in a facility that uses peanuts, wheat and other tree nuts. Contains coconut, almonds, soy, milk and sulfites. Chocolate flavored coating (maltitol, palm kernel oil, milk protein concentrate, cocoa powder, calcium carbonate, soy lecithin, natural flavor), coconut almonds, polydextrose, glycerin, maltitol syrup, whey protein isolate, water, palm kernel and palm oil, vitamin mineral mix [tricalcium phosphate, calcium carbonate, magnesium oxide, vitamin A palmitate, ascorbic acid (vit C), sodium ascorbate, thiamin mononitrate (Vit B), pyridoxine hydrochloride (Vit B6), cyanocobalamin ( Vit B12), Dl-alpha-tocopheryl acetate ( Vit E), niacinamide, biotin, d-calcium pantothenate, zinc oxide, chromium chelate, phytonadione ( Vit K1), sodium selenite], gum arabic, salt, natural flavor, soy lecithin, mixed tocopherols, potassium sorbate, sucralose, sodium metabisulfite. This product is mfg. in a facility that uses peanuts, other nuts and seeds. Soy crisps (soy protein isolate, calcium carbonate, oat fiber), glycerin, almonds, maltitol, palm kernel and palm oil, polydextrose, gum arabic, whey protein isolate, dehydrated cranberries, sunflower seeds, whole grain rolled oats, hydrolyzed gelatin, natural and artificial flavors, Contains less than 2% of: water, coconut, calcium carbonate, soy lecithin, vitamin mix sucralose, sunflower oil. Vitamin Mix:vitamin A palmitate, ascorbic acid (vitamin C), niacinamide (vitamin B3), riboflavin (vitamin B2), thiamin mononitrate (vitamin B1), folic acid (vitamin B9), dl-alpha-tocopheryl acetate (vitamin E). Contains soy, milk, almonds and coconut. Made in a facility that also uses peanuts, wheat and other tree nuts. This product is manufactured in a facility that uses eggs, wheat, seeds, peanuts and tree nuts. Roasted almonds, toasted coconut, maltitol syrup, polydextrose, dark chocolate flavored coating [palm kernel oil, maltitol, milk protein concentrate, cocoa (processed with alkali), dextrose, soy lecithin, vanilla extract], water, sunflower oil, salt, natural flavor, sucralose. Chocolate flavored layer (fructooligosaccharides, polydextrose, palm kernel and palm oil, water, glycerin, cooca powder (processed with alkali), unsweetened chocolate, nonfat dry milk, salted butter (cream, salt), mono and diglycerides, soy lecithin, salt, sodium citrate, natural flavor, sucralose, carrageenan) chocolate flavored coating (palm kernel oil, polydextrose, maltitol, whey protein concentrate, cocoa powder (processed with alkali), whole milk powder, soy lecithin, salt, natural and artificial flavor, sucralose, acelsulfame potassium), cocoa, soy nuggets (soy protein isolate, cocoa powder (processed with alkali) tapioca starch), glycerin, maltitol, sunflower oil, hydrolyzed gelatin, maltitol syrup, unsweetened chocolate ( processed with alkali), palm kernel and palm oil, fructooligosaccharides, polydextrose soluble corn fiber, milk protein isolate, cocoa butter, water, salt, vitamin mineral mix [magnesium oxide, sodium ascorbate, ascorbic acid (vitamin C), dl-alpha tocpheryl acetate (vitamin E), niacinamide, zinc oxide, D-calcium pantothenate, vitamin A palmitate, thiamin mononitrate, pyridoxine hydrochloride (vitamin B6), riboflavin (vitamin B2), chromium amino acid chelate, folic acid, biotin, sodium selenite, phylloquinone (vitamin K1) cyanocobalamin (vitamin B12)), nonfat dry milk, natural and artificial flavors, cellulose, soy lecithin, sucralose, salted butter (cream, salt) acesulfame potassium. Contains milk and soy. This product is manuactured in a facility that uses peanuts, tree nuts, eggs, wheat and sesame seeds. Protein blend (soy protein isolate, whey protein concentrate, milk protein isolate, whey protein isolate), soluble corn fiber, polydextrose, vegetable glycerin, palm kernel oil, rice flour, almond butter, coconut oil, sunflower oil, whey powder, rice starch, contains less than 2% of: natural flavor, salt, citric acid, mixed tocopherols (to maintain freshness), soy lecithin, vanilla powder, sucralose. Contains soy, milk and almonds. Made in a facility that also processes eggs, peanuts, wheat and other tree nuts. Soy crisps (soy protein isolate), polydextrose, glycerin, palm kernel and palm oil, peanuts, peanut butter (ground peanuts), whey protein isolate, cocoa powder (processed with alkali), gum Arabic, contains less than 2% of : natural and artificial flavors, whole milk powder, water, whole grain rolled oats, salt, milk protein isolate, soy lecithin, sucralose, acesulfame potassium. VITAMIN MIX: Vitamin A palmitate, ascorbic acid (vitamin C), niacinamide (vitamin b3), riboflavin (vitamin B2), thiamine mononitrate (vitamin B1), folic acid (vitamin b9), dl-alpha-tocopheryl acetate (vitamin E). Protein blend (soy protein isolate, whey protein concentrate, milk protein isolate, whey protein isolate), soluble corn fiber, vegetable glycerin, polydextrose, palm kernel oil, white chocolate chips (sugar, cocoa butter, milk, nonfat milk, milk fat, soy lecithin, vanilla extract), macadamia nuts, almond butter, rice flour, coconut oil, sunflower oil, contains less than 2% of: whey powder, rice starch, natural flavor, salt, mixed tocopherols (to maintain freshness), soy lecithin, vanilla powder, sucralose. Contains soy, milk, almonds, macadamia nuts. Made in a facility that also processes eggs, peanuts, wheat and other tree nuts. "Atkins" has become virtually synonymous with successful fat loss and Atkins Advanage Bars are used by millions of people to help keep weight loss on track. The Atkins approach is actually very simple; eat a healthy varied diet, keeping carbs to a bare minimum while emphasizing protein and moderate amounts of fat. The greatest thing about this Atkins approach is, it works. The not-so-great thing is that we don't really live in an Atkins-friendly world and it's hard finding healthy foods that fit neatly into the Atkins program. Nutrition bars are a great example. You can read label after label trying to find the right ratio of protein, fats and carbs without ever really finding the perfect balance. So it's easy to end up settling for a bar with too many carbs or too little protein. We hope you'll give the Atkins Advantage bars a try. Of course each Atkins Advantage bar has an Atkins-oriented nutritional profile, so they are the perfect between-meal snack for dieters or those trying to lean up. Advantage bar fans include busy professionals, dieters, working parents, athletes and trainers who all appreciate their great taste, choice of flavors, and convenience. Advantage bars utilize the highest-quality protein sources like casein, whey isolate and soy. This combination of fast-absorbing whey and slow-absorbing casein is a good idea, since it makes the Advantage bar more satisfying than some other bars. Advantage bars also supply fiber, which helps to fill you up but without adding any additional calories. The protein content of the Advantage bar is about 19 grams. To put that into perspective, 19 grams is a little more than you'd get by eating 3 whole eggs. The Advantage bars have only a tiny fraction of the cholesterol in 3 eggs, however. Atkins balances the protein content with a lower amount of fat and almost no carbs or sugars (1g). This ratio of high protein, moderate fats and low or no carbs and sugars is key to the success people have had with the Atkins' approach. Keep a few Advantage bars in your desk at work, and pack a few into your bags or briefcase; you'll always have a convenient and healthy snack handy and won't have to resort to fast food or convenience foods. 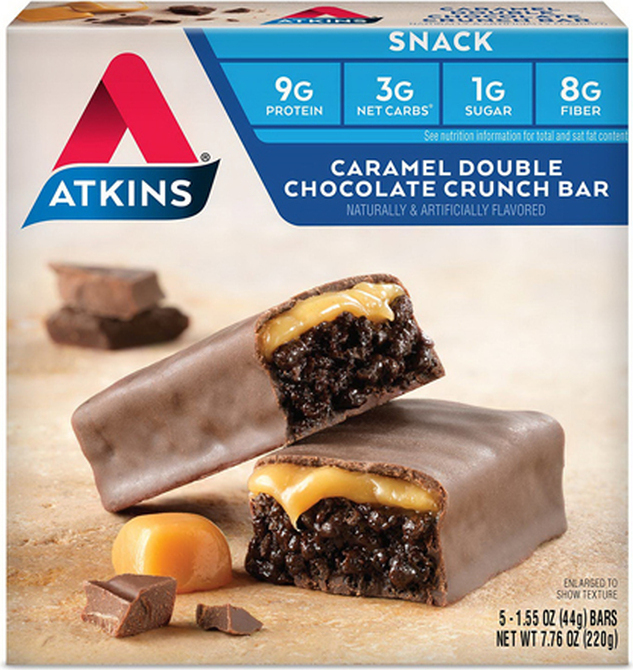 Atkins' New Dark Chocolate Decadence is an irresistible treat with layers of dark chocolate crisps and thick fudge dipped in dark chocolate and topped off with a caramel drizzle. Without sacrificing nutrition, this snack is a masterpiece.